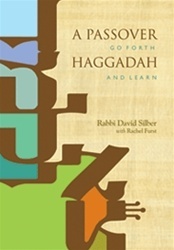 Rabbi Silber has given us two books in one: the Haggadah itself, in English and Hebrew, with his seder commentary and a collection of essays that provide close readings of the classic biblical and rabbinic texts that inform Seder-night ritual and narration. Both parts work beautifully together to illuminate the central themes of Passover: peoplehood, Covenant, our relationship to ritual, God’s presence in history, and other important issues that resonate with us all. Just as midrash attempts to bridge the gap between ancient text and contemporary meaning, Rabbi Silber’s Haggadah provides new sources of insight that deepen the Passover experience for today’s readers.